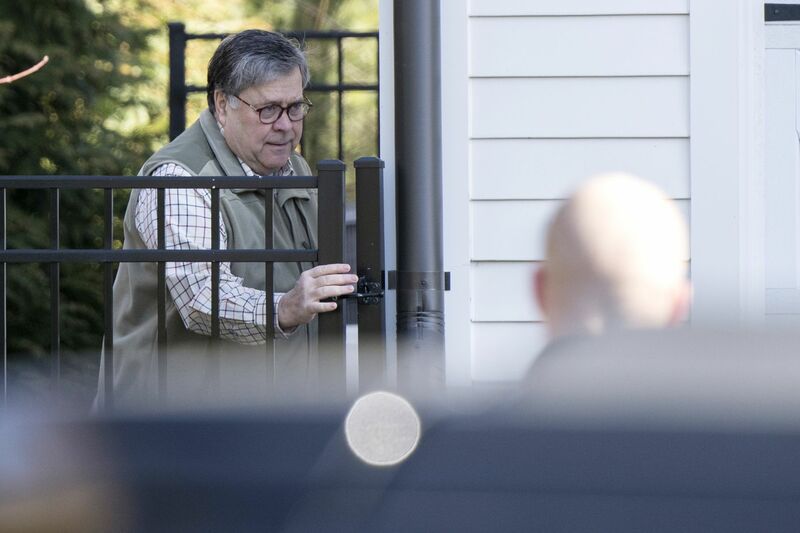 Attorney General William Barr penned a less-than-four-pages summary of the nearly 400-page Mueller Report. Last Thursday night, Americans took to the streets to protest our nation’s latest innovation in the world of scandal: The cover-up of a cover-up, which after more than two weeks is pretty much the only way to characterize how the most anticipated report into White House corruption in a generation has been bottled up with a less-than-four-page “trust me” summary from an attorney general just appointed by the president being investigated. And let me be clear: When I say that Americans took to the streets to protest this outrageous state of affairs, I mean several thousand citizens, in a nation of 320 million. As I watched the pictures from the demonstrations — which called on Attorney General William Barr to release the entire nearly 400-page report from special counsel Robert Mueller on issues surrounding Russian interference in President Donald Trump’s 2016 election win — pop up in my Twitter feed, something struck me about the hearty souls out on an unseasonably chilly April night, from the White House fence to the courthouse in suburban West Chester. The majority of these people so worked up about the Barr cover-up of an alleged Trump cover-up to make signs and voice their anger looked to be primarily from my generation — baby boomers, probably with an average age probably close to the landmark (60) that I just hit a couple of months back. Of course, they were. The people who grew up with Vietnam-era protest songs blaring in mono from an AM car radio, who stayed up past their summer camp bedtimes to watch Richard Nixon resign on a hot August night in 1974, are the generation raised at the fulcrum of two worlds: the can-do, fighting-fascism brio of post-World War II American dreams, and the decades of lost faith and cynical manipulation that inaugurated in the 1970s. It was an era of both stupendous wrongs (government lying about the conflict in Southeast Asia, the “dirty tricks” of Nixon’s buggings and break-ins) and heroic figures: the whistleblower Daniel Ellsberg who leaked the Pentagon Papers, the honest Watergate judge, John Sirica, the simple “country lawyer” of North Carolina’s Sam Ervin seeking the truth about Nixon. To come of age in those years (as tens of millions of U.S. citizens did ... they don’t call it a baby boom for nothing!) was to grow into a uniquely American narrative that fused cynicism and hope. Yes, the United States still struggled with corruption, injustice, and ill-advised flights of imperialism, but there was also a system that could deal with the worst excesses. And so it was that when America produced its worst crisis in 40 years, when a man described by his own lawyer as a “racist ... conman ... cheat” was elected our 45th president, folks with that story line hard-wired into their nervous system waited for someone to activate the switch and turn the system on. Some 29 months later, we’re still waiting. Go to Amazon.com and you will see not one but two popular listings where you can preorder your copy of the Mueller Report. One of them is listed by the Washington Post, which also assigned two top journalists to analyze the report and which bills its version of this historic document as “the most complete and authoritative available.” (Technically speaking that’s not wrong ... think about it.) The editors of the Washington Post are people who grew up with the Senate Watergate Report, the Starr Report, the 9/11 Commission report — so why wouldn’t the Mueller Report be released? I guess the question is: Who’s living a more delusional dreamworld: the Post or the people preordering a nonexistent book who’ve made its current sales rank No. 674? Here’s the state of play right now, two weeks after Barr published the Mueller Report: the Cliffs Notes Edition. Barr insists that a much more informative “version” of the Mueller Report is coming, after a series of redactions — a task that could have been done with Mueller’s help in hours yet which for some reason is taking the attorney general and his massive Justice Department days, which are now turning into weeks. The slow-walking of the Mueller redactions is a “tell,” as is the AG’s failure to go before a judge and ask for permission to disclose grand jury material — as was done in Watergate. That’s because every judgment call from Barr has been on the side of slowness, obfuscation, and whatever is good for Trump, and never on the side of transparency, the inherent right to know, and whatever is good for the American people. You don’t need a Harvard law degree to see what’s really happening here. Barr and Team Trump surely knew that today’s media and political tornado abhor a vacuum, and so they were able to fill it — with the president’s bogus claim of “total exoneration,” backed up by an online lynch mob going after any journalist who insists otherwise with their torches and pitchforks. Yes, Team Mueller, in its weird button-down way, is finally making it known that the Barr letter isn’t exactly what’s in the report, and, yes, it’s possible that pressure from Democrats may eventually force the release of decent-sized chunks of the full document. But if that happens, alarming disclosures about the president or his team will be greeted with cries of “We already knew that!” and “So what? It’s not a crime!” and “When are the dead-end Democrats and the ‘fake news’ going to stop with the conspiracy theories?" And then get ready for a giant pitchfork in the tuckus for anyone who disagrees. If you thought that Congress — after two years of total Republican obstruction that allowed bombshell revelations about Team Trump misconduct to slowly rot into “old news” — could dust itself off and conduct an in-depth investigation in the mode of Ervin, Peter Rodino and their Watergate-era ancestors without the GOP labeling it a partisan “witch hunt” that TV’s talking heads will browbeat as “Democrats blowing the 2020 election,” you’ve been living in a dreamland. If you thought that the media would be able to process that the Barr letter was an obvious sham — not to mention the even-more-obvious fact that we’re less than 1 percent closer to knowing what’s in the real Mueller Report than we were when when they were breathlessly waiting for it in February — and not instead instantly run with banner headlines that the president has been cleared, you’ve been living in a dreamland. If you think that America’s drift toward authoritarianism under Trump — not just the stuff that Mueller investigated but the rank corruption and the increasingly brown-shirted cruelty toward refugees — will eventually cause the masses to rise up, when the young people who are typically the vanguard of any revolution have been raised in the cocoon of the soma of cyberspace and resume-driven parenting to worry about different things than you do, then you’ve been living in a dreamland. And if you think that an independent judiciary is going to ultimately save the day the way Sirica and a unanimous Supreme Court preserved the rule of law during Watergate, after Senate Majority Leader Mitch McConnell and his minions shredded the Constitution to gain control of the Supreme Court and are now ramming through an army of right-wing judges for the next 30-40 years, then ... maybe it’s time to wake up. Donald Trump is not going to be impeached, and it boggles my mind that anyone even suggests that a cabinet handpicked for its Trumpian loyalty would consider the 25th Amendment, no matter how much the president unravels in public. In fact, Trump won’t even be denied a second term unless something changes the status quo — 40 percent whose hatred of the media and fear of a diverse America trumps anything that happens in this White House, the 6 percent who’ll be peeled off by the Democrats’ endless civil wars and Facebook manipulation, and an Electoral College created to preserve slavery that, in a perverse way, still is. The irony is that the Barr cover-up somehow managed to reveal the one thing every American needs to know. That the dreamland of a working democratic system — in a landscape populated by an empowered, truth-seeking Congress, honest judges, and investigative reporting that can change public opinion — died a long, long time ago. Knowing that is both terrifying and empowering. Because the real, radical work of waking up can finally begin.